Brazil with its capital Brasilia is located in South America (Eastern South America, bordering the Atlantic Ocean). It covers some 8,515,771 square kilometers (slightly smaller than the US) with 207,353,000 citizens. Portuguese, Spanish, English and French are the languages commonly used by the people in Brazil (consider regional differences). Argentina, Bolivia, Colombia, French Guiana, Guyana, Paraguay, Peru, Suriname, Uruguay and Venezuela are bordering countries. Brazil is the largest country in South America. Famous for its football (soccer) tradition and its annual Carnaval in Rio de Janeiro, Salvador, Recife and Olinda. Owing to Brazil’s continental dimensions, varied geography, history and people, the country’s culture is rich and diverse. Music plays an important part in Brazilian identity. Styles like choro, samba and bossa nova are considered genuinely Brazilian. Brazil has many exciting cities, ranging from pretty colonial towns and coastal hideouts to hectic, lively metropolises. Brazil is a huge country with different climate zones. In the north, near the equator there is a wet and a dry season; from about Sao Paulo down to the south there is spring/summer/fall/winter. Brazil is one of a few countries that uses both 120 and 240 volts for everyday appliances. Expect the voltage to change back and forth as you travel from one place to the next -- even within the same Brazilian state, sometimes even within the same building. There is no physical difference in the electric outlets (power mains) for the two voltages. To reach someone Brazil dial +55 prior to a number. The local cellular networks are operated on 850 MHz, 900 MHz, 1800 MHz, 1900 MHz, 3G, 4G. Websites typically end with the top level domain ".br". If you want to bring electric appliances (e.g. battery chaarger), keep in min the local 127 V / 220 V - 60 Hz (plugs: C, N). The sign for the locally used currency Real is BRL. 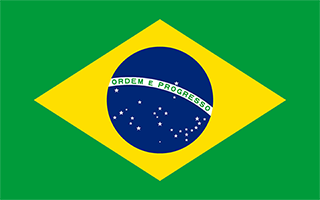 Green with a large yellow diamond in the center bearing a blue celestial globe with 27 white five-pointed stars; the globe has a white equatorial band with the motto ORDEM E PROGRESSO (Order and Progress); the current flag was inspired by the banner of the former Empire of Brazil (1822-1889); on the imperial flag, the green represented the House of Braganza of Pedro I, the first Emperor of Brazil, while the yellow stood for the Habsburg Family of his wife; on the modern flag the green represents the forests of the country and the yellow rhombus its mineral wealth (the diamond shape roughly mirrors that of the country); the blue circle and stars, which replaced the coat of arms of the original flag, depict the sky over Rio de Janeiro on the morning of 15 November 1889 - the day the Republic of Brazil was declared; the number of stars has changed with the creation of new states and has risen from an original 21 to the current 27 (one for each state and the Federal District).